"In 2016, the Development of Early Christian Theology SBL section hosted a review panel of two recent monographs about Epiphanius of Cyprus: Young Richard Kim's Epiphanius of Cyprus: Imagining an Orthodox World and Andrew Jacobs' Epiphanius of Cyprus: A Cultural Biography of Late Antiquity. Dr. Jacobs continues the panel with an introduction to the work of Young Richard Kim." I want to thank Mark DelCogliano and the section unit for inviting me to the Early Christian Theology Section of SBL to talk about everyone's favorite late ancient curmudgeon. I'm especially grateful for the opportunity to give a brief, but hopefully faithful, description of an important book. In this first, full monograph on Epiphanius of Cyprus written in English, Young Richard Kim sets for himself an ambitious task: to draw Epiphanius out of the historiographic shadows and give him his "just due for his unique contributions to the history of late antiquity and late ancient Christianity" (1). Young’s main instrument in this task is close and contextual readings of key scenes in Epiphanius's master-work, the heresiographic Panarion, as autobiographical moments that allowed Epiphanius to imagine an orthodox world and his own central place in it. As Young acknowledges in his introduction, his job is made particularly difficult in three ways. First, Young must overcome the particular (and, perhaps, unique) distaste in which modern (primarily Anglo-American) scholars hold Epiphanius. Not only do many find him to be anti-intellectual and overzealous, they find him distinctly untruthful. The second difficulty is one of genre: like most heresiologies (but compounded by its encyclopedic scope), the Panarion is equal parts sensationalist and boring. When we are not asked to envision scenes of orgiastic ritual that defy credulity we are being asked to read repetitive excerpts of previous authors that belie authorial creativity. What we do not suspect as untruth (or at least exaggeration) we bracket as "citation" (or outright plagiarism): how much Epiphanius can we find in Epiphanius's masterpiece? The final difficulty Young articulates quite sensibly in his introduction: Epiphanius's "recollections [in the Panarion] were the products of his imagination, and he constructed his life to provide readers with an idealized public image situated in strategic loci in his heresiology" (12). How does a modern scholar navigate between Epiphanius the "historical person" and Epiphanius the "rhetorical persona" (ibid.)? For Young, the response to each of these difficulties lies in the gerund of his subtitle: imagining. Epiphanius is, for Young Kim, the master imagineer (to borrow the Disney neologism): the Panarion is a text in which Epiphanius imagines himself, and his world, and also the instrument by which he conjures that world (and that self) into existence. While Young does insist, in various places, that there is a real personal history behind Epiphanius's anecdotes, he must also--perhaps even a little paradoxically--allow that "reality" to blur into a space of imagination and performance. Young is successful to the degree that we, as readers, are willing to squint and allow these realities to co-exist. As Young notes, he has not produced a traditional biography; arguably, the remains of Epiphanius do not allow for a coherent life narrative we might construct, for instance, out of the seemingly endless writings of Augustine. (Although perhaps the imagineering quality of Epiphanius's biographical remains might cast a salutary shadow on other imaginative late ancient self-creators, like Augustine.) Instead Young pairs three sets of Epiphanius's autobiographical "moments" from the Panarion with close and careful analyses of Epiphanius's various mature personae.In the first section, "Beginnings," Epiphanius the youthful monastic novice in Egypt is juxtaposed with Epiphanius the world historian. The story inaugurating chapter 1 from Epiphanius's youth, recounted toward the end of Panarion 26 (against the gnōstikoi), has become famous as (paradoxically) both a source for Sethian myth and ritual and evidence of Epiphanius's tendency toward the scandalous and the slanderous. Epiphanius recounts how "in his youth" he almost fell prey to the honeypot schemes of Gnostic women who recounted to him various heretical myths and rituals and let him read various Gnostic books, and tried to seduce him--literally and figuratively--into their heretical fold. Epiphanius is not fooled, and turns the heretics into the local bishops; "about 80" are rooted out and disciplined. It's a colorful story (I use it to some effect in my book, too), and Young puts it to multiple uses in this chapter. On the one hand, it allows him to reconstruct the possibilities of Epiphanius's monastic formation through a review of the theological and ascetic landscapes of early fourth-century Egypt. On the other hand, Young can trace the ideological landscapes sketched out by Epiphanius: the gendered nature of heresy, its reliance on arcane and mystifying texts, its polluted and immoral rituals, and (of course) the triumph of the heresiologist and the powerful arm of bishops. If the two landscapes blur into each other - the contextual and ideological - I think this is deliberate. I'm not sure that we have fully taken account of how much our narrative of the fourth century is shaped by Epiphanius's narrative, a point to which Kim will return later in the book. Epiphanius's masterful imagineering of his youthful landscapes returns in chapter 2, as Young tackles Epiphanius's particular heresiological history in the Panarion. Just as Epiphanius "remembers" an ideological Christian landscape as his "origin story" in Panarion 26, so in the first chapters of the Panarion (which recount "heresy" from Adam to the advent of Christ) Epiphanius shapes a similar ideological framework for the origins of all humanity. As Young explains, Epiphanius was not the first Christian to mold world history to a Christian framework. His genius was to hereticize that Christian world history and, therefore, to historicize Christian heresy: the distant past was a story of theological degeneracy that continued to play out in Epiphanius's own day. The heretical threats of the 370's, he suggested, were echoes of a deep past that must continue to haunt a Christian world. In the second section of the book, "Transitions," Epiphanius the rigorous monastic abbot in Palestine foreshadows Epiphanius the historical theologian, who both narrates the history of Nicene orthodoxy and becomes, in the process, its continuator and guarantor. Two anecdotes from Epiphanius's time as a monastic abbot in Palestine serve as our point of departure in chapter 3. In Panarion 30, against the Ebionites, Epiphanius recalls meeting the Nicene bishop Eusebius of Vercelli in exile in Scythopolis. There he also meets Joseph, a Nicene nobleman and convert from Judaism who tells tales of his own conversion decades earlier as well as his life among Arian heretics in Palestine. In Panarion 40, against the Archontics, Epiphanius recalls a monk named Peter who spread “Gnosticizing” heresy among his own monks; he was cast out by Epiphanius but not before he had "spread his tare" to a certain Eutaktos who ended up taking the Archontic heresy far and wide. Just as chapter 1 allowed Young to trace the intertwined contextual/ideological landscapes of Egypt, so these two scenes open up the Epiphanian landscape of Palestine, the heretical holy land imagineered by memory and ideology to convey at once Christian triumph and vulnerability. It was ultimately a site where Epiphanius could not "live out his imagined reality" (103). Epiphanius's personalized and regionalized narrative of heresy encountered and narrowly averted expands onto a much wider scope in Young’s next chapter, which addresses Epiphanius's dual role as "historian" of the Nicene partisans (clustered primarily around the theological beliefs and political acts of Athanasius) and as continuator (and covert innovator) of their work. Young begins with the circumstances under which Epiphanius composed his rather rambling theological treatise, the Ancoratus. According to letters (preserved by Epiphanius) as a preface, regional clergy facing "heretics" demeaning the divinity of the Holy Spirit reached out to Epiphanius for guidance in divine matters. Epiphanius, in this project, insinuates himself as the natural heir to Athanasius's theological mantle. What's more, as Young demonstrates in the rest of the chapter, Epiphanius naturalizes the very idea of a theological mantle, that is, the long continuity of orthodox, Nicene thought from the time of the great council to his own day. The long chapters on Trinitarian heresy in the Panarion, preserving selections and fragments of fourth-century theological writings, conjure a chronology that echoes and reinvents the hazy primeval history of the early chapters of the Panarion. (The heroes and villains of Epiphanius's fourth-century Trinitarian saga still populate our modern reiterations of this theological history.) Yet, as Young also points out, even as Epiphanius smooths over and homogenizes his Nicene pedigree he reveals cracks in its unified front, emblematized most clearly by his shifting and shifty thinking about divine hypostases. In the third section, "Ascents," Epiphanius the arbiter between rival claimants to an episcopal throne enables the emergence of Epiphanius the diagnostic heresiologist. After speculating on the road Epiphanius might have taken from Palestinian abbot to Cypriot bishop - a curious episcopal cursus in no way clarified by Epiphanius himself - Young focuses on a scene in Panarion 77 (against the Apollinarian Dimoirites or "two-thirdsers"). Here Epiphanius recalls intervening--apparently at no one's invitation--among the multiple claimants to the see of Antioch. He interviews two claimants (Paulinus and Vitalius), determines the orthodoxy of the former and the heresy of the latter, and goes on his way. As Young explains, nothing is resolved and perhaps that is beside the point. Epiphanius's own ability to survey, scrutinize, and diagnose is what matters. The bishop's diagnostic acumen leads Young in chapter 6 to analyze the naturalist discourse that undergirds the Panarion: snakes and insects and poisons all evoked as figures of heresy and all requiring the masterful diagnosis and antidote in the form of orthodox piety. "Knowledge was the key to keeping the church pure," Young observes of Epiphanius (175). While the zoological heresiology on display might seem arcane and harmlessly antiquarian, Young points out that it also distinctly weaponizes the diagnostic gaze of the bishop. (Medicine was, in antiquity, often a very painful business.) Through his naturalist heresiology, Epiphanius deploys multiple strands of rhetorical violence (and, we might equally suppose, literal violence, although Young notes: "Epiphanius never encouraged his readers to physically attack any of the heretics" ). Framing heresies, and heretics, as poisonous serpents and insects, Epiphanius simultaneously frames himself as their master and refuter, the ultimate authority on a world teeming with theological dangers. The final chapter, "To Infamy and Beyond," reconstructs Epiphanius's turbulent career after the publication of the Panarion, the 25 or so years during which he lived the Christian ideology he imagineered in his greatest work: "Like an actor following a script," Young writes, "Epiphanius spent the rest of his life putting his words into action" (204). At the center of this action, absorbing the last decade of his life, was his crusade against the followers of Origen which took him from his old stomping grounds in Palestine to dramatic public confrontation with Bishop John of Constantinople. The complex narratives of history, memory, heresy, and difference that Epiphanius spun in the Panarion came to characterize Christianity as it entered the fifth century. 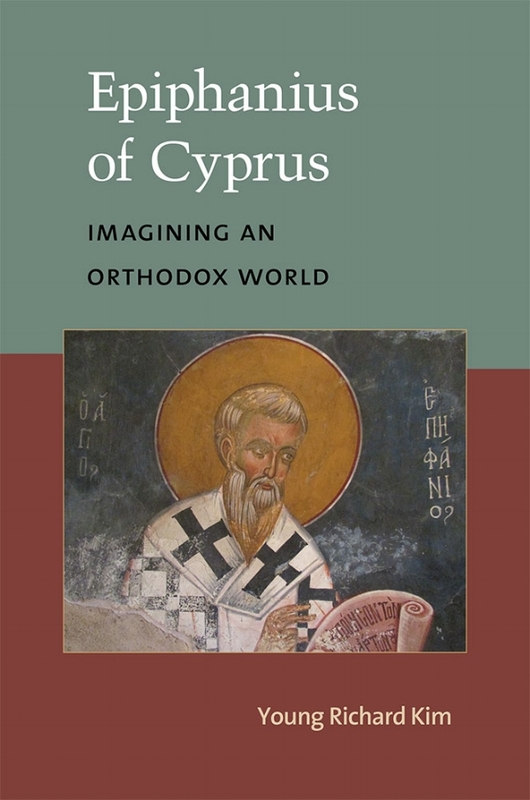 Indeed, as Young claims at the outset of this excellent work, the legacy of Epiphanius's imagined orthodox world was potent enough to support a claim that "Epiphanius of Cyprus was late antiquity" (1).